(Family Features) People are understandably conscious about the foods they’re eating and where they come from. The human eating space has seen the rise of whole, clean and natural foods, and in the last couple years, the trend has even moved into pet foods. Many pet parents who eat healthy and care about where their food is coming from have those same thoughts about their pet’s food, as well as their family’s. Healthy eating is as simple as being mindful of what you eat and being more aware of the origin of your food and its ingredients. These tips can help your whole family lead a more healthy life. For more information and tips for sharing your healthy lifestyle with your pet, visit Nutro.com. Nosh on Nutrients – Opt for healthy, recognizable ingredients instead of overly processed foods. Make sure you’re providing your family with plenty of fruits, vegetables and quality proteins, such as chicken, salmon or lamb. These ingredients are also beneficial for dogs, so look for a pet food that includes them as well. Be Mindful of Your Meals – Being more aware of what you’re putting into your body is a first step toward making better choices. Try keeping a food journal to keep yourself more accountable for everything you eat. Jot down when you eat and how it makes you feel to help recognize which foods are making you feel good and which ones aren’t. Have Dinner at Home – When you cook dinner at home, you have more control over the ingredients your family is consuming. Try to cook at home most nights to avoid potentially unhealthy restaurant fare that could have an unexpectedly high calorie count. It’s also an opportunity to spend quality family time at home and build cherished memories. Allow your dog to share in the family experience by serving him dinner at the same time. Plus, he’ll likely be less tempted to beg for table food if he has his own bowl to keep him busy. Teach Your Tots – Educate your family members about nutrition and include them in the process, from the grocery store to the kitchen to the table. The more you know about your food and the nutrition it provides, the healthier the choices you can make to maintain a healthy life. 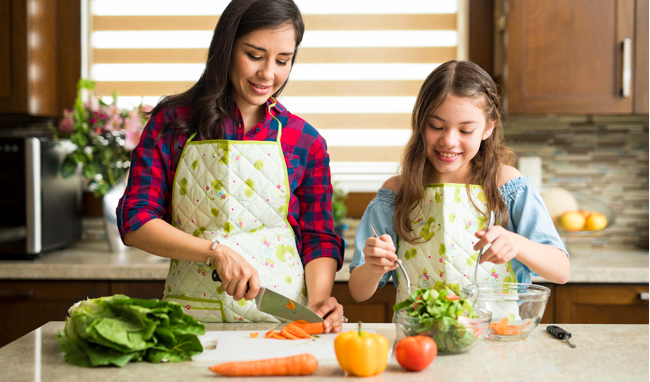 By incorporating your kids in the kitchen and allowing them to help cook, you can set them up for a greater chance of success in their own kitchen someday. Don’t Forget the Dog – Some pet food brands make it simpler to share a food philosophy with your pet. For example, with its NUTRO FEED CLEAN™ philosophy, the NUTRO™ brand promises its recipes are simple, purposeful and trustworthy. Just like the food you’d want to feed your family, its dry dog food recipes are made with real, recognizable ingredients as close to their native form as possible.